Jim’s Interior Painters Thornlie can improve the ambience of one of Perth’s most beautiful and leafy suburbs. A well-maintained and smart looking home will increase in value. It will also make you beam with pride as a proud home-owner. Your local Jim’s Professional Painters understand the area well. They know how to add pizazz to your home or business while keeping with the true essence of Thornlie. Jim’s Interior Painters Thornlie have the expertise to transform any backyard into an outdoor oasis. From fences, decks, retaining walls and sheds through to entertaining areas, gazebos, pergolas, and patios. No matter what the surface, we can transform it all. By painting, staining and decorating these areas with stunning finishing touches, Jim’s Interior Painters Thornlie take your backyard from drab to WOW! Jim’s Interior Painters Thornlie are a popular choice. We have been engaged to paint many new homes being built in the up-and-coming housing estates. Perhaps you desire a modern look based on international trends and colour forecasts. Or, you have your heart set on your own personal colour combinations and ideas. Don’t worry, we have the prowess to do it all! 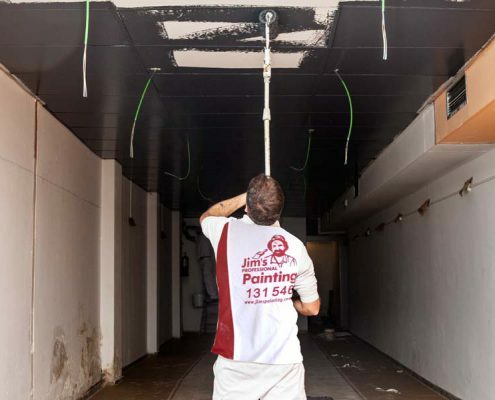 With Jim’s Interior Painters Thornlie you are guaranteed the highest quality paint job from start to finish. We have cost effective painting solutions and undertake quality assurance measures. Many people choose the Jim’s network because the name is synonymous with quality. It’s a reputation we’ve earned and we’re proud to uphold.